Sir Ian McKellen’s 1995 film production of William Shakespeare’s Richard III answers that age-old question: How does a one-armed man pee without getting urine stains on his trousers? Well, for the sake of not spoiling the movie, and appetites everywhere, I shall refrain from divulging that little piece of trivia, but this example serves to warn the reader – this isn’t your standard Shakespearean performance. Those of you who can’t relate to men in tights uttering archaic English will be in for a most pleasant surprise; there’s enough war, intrigue, and betrayal to satisfy even those who normally eschew the Immortal Bard. Moving beyond Shakespeare’s content, the film features musical numbers evocative of the Golden Age of Hollywood. As bizarre as that sounds, Ian McKellen masterfully integrates both to provide new insight into the characters and their motivations in a way that straight drama cannot. 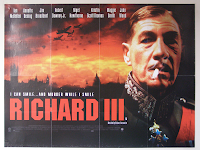 McKellen’s Richard III is set in the fascist era of 1930s Europe where the Machiavellian machinations of the early Renaissance seem quite at home. Drawing heavily from Nazi pageantry, much of the action is set in or near monumental architecture, creating a paranoid atmosphere where the individual is overwhelmed by the power of the state. The good are slowly eliminated, toadying sycophants get promoted, the mediocre are easily manipulated, and the king is mad. By updating Richard III, McKellen gives a glimpse of history as it was, as it is, and as it could be; retaining the play’s cautionary tale of the abuse of power. 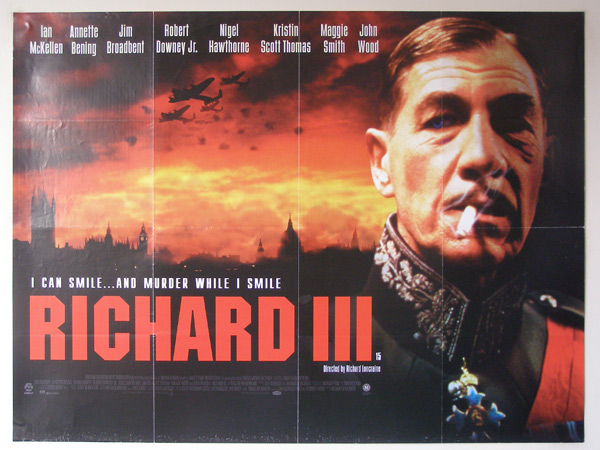 Richard III, as portrayed by McKellen, is an Everyman of absolute rulers. Courageous, though morally and physically crippled, McKellen’s Richard sets about the business of usurping the throne with a glee of self-satisfaction that is infectious. This is particularly apparent in one early scene set a crowed hospital emergency room. Here, Richard succeeds in seducing Lady Anne Neville, in a morgue or all places, and then segues into a 1930s-esque musical number with an ease that seems almost criminal. McKellen uses our preconceptions about classic film to lure us into a familiar place. So, rather than being a distraction, the viewer is drawn deeper into the film and its reality. McKellen takes us into Richard’s conspiracy by speaking directly to the camera, breaking down the invisible “fourth wall” separating performer and audience. In this way, we become Richard’s confidants and share his unbounded joy in his pursuit of power. McKellen invites us to become characters in the play by seducing us as well. Along with other characters in the play, we fall under Richard’s spell. Without disparaging Sir Lawrence Olivier’s masterful performance in the 1955 film version, I felt more of a connection to the play’s thematic content in McKellen’s version and came away with deeper understanding of Richard’s motivations. A generous performer, McKellen cast an ensemble of noted British and American actors including Annette Bening, Jim Broadbent, Robert Downey Jr., Sir Nigel Hawthorne, Kristin Scott Thomas, Dame Maggie Smith, John Wood, and Dominic West. Some roles from the play are expanded or combined to provide the actors with the room to develop their parts so that the film does not hang on the performance of any one person alone. With apologies to purists who frown upon any editing of the Immortal Bard’s words, the adaptability of the play underscores the universality of the themes Shakespeare explores and the characters he creates. In a final, haunting moment the night before his final battle, we find Richard tormented by his nightmares, reduced to tears by the voices of his many victims. One almost feels sorry for Richard in this state as we have been lulled into sympathy by McKellen’s creative delivery of centuries-old dialogue. Indeed, it is McKellen’s unique interpretation of his lines that is this film’s lasting contribution to the enduring legacy of this play. Compared to Olivier’s Richard III, McKellen daringly takes a great risk in giving a new twist on a sacred thespian role, but his gamble pays off. War, love, hate, lust, greed, cowardice, heroism, sacrifice, honor, and revenge – the full tragedy of the human condition is explored in 104 minutes of film. If nothing else, you’ll learn how a one-armed man can pee without getting urine stains on his trousers while quoting Shakespeare.